Basel, May 4, 2017 - Novartis announced today that it has notified Conatus Pharmaceuticals Inc., of its exercise of the option to an exclusive license for the global development and commercialization of emricasan, under the option, collaboration and license agreement signed with Conatus on December 19, 2016. The exercise of the option with Conatus, a biotechnology company focused on the development of novel medicines to treat liver disease, and grant of exclusive license to Novartis will be effective upon receipt of all required anti-trust approvals and payment of USD 7 million option exercise fee to Conatus. This follows the initiation of the Phase IIb ENCORE-LF trial by Conatus evaluating emricasan in patients with decompensated liver cirrhosis caused by nonalcoholic steatohepatitis (NASH). This collaboration has the potential to expand treatment options for people in various stages of fatty liver disease, where no approved medicines currently exist. "We are pleased to add another important medicine to our liver portfolio with emricasan, which has shown potential in patients with advanced fibrosis and cirrhosis," said Vas Narasimhan, Global Head, Drug Development and Chief Medical Officer, Novartis. "We look forward to advancing our broad portfolio of NASH and chronic liver disease programs to address this growing unmet need." Novartis is developing Farnesoid X receptor (FXR) agonists for the treatment of chronic liver diseases. As part of this collaboration, Conatus will conduct multiple Phase IIb clinical trials with emricasan in NASH. If results are positive, Novartis would then conduct Phase III studies of emricasan as a single treatment as well as development of combination therapies with an FXR agonist. FXR agonists have been shown to address three of the most important aspects of NASH progression by reducing fat, inflammation and fibrosis in the liver. The most advanced Novartis investigational compounds, both non-bile acid FXR agonists, are in Phase II clinical trials. Both of these FXR agonists have received Fast Track designation from the US Food and Drug Administration (FDA) for NASH with liver fibrosis. In addition, the FDA has granted Fast Track designation for the development of emricasan in patients with NASH cirrhosis. Recently, Novartis announced a clinical collaboration with Allergan to conduct a Phase IIb study, involving the combination of a Novartis FXR agonist and Allergan's cenicriviroc (CVC) for the treatment of NASH with liver fibrosis. Both collaborations with Conatus and Allergan continue to support the growing Novartis portfolio to develop new therapies in chronic liver diseases, including NASH. Emricasan is an investigational, first-in-class, oral, pan-caspase inhibitor for the treatment of non-alcoholic steatohepatitis (NASH) with advanced fibrosis (scarring) and cirrhosis. To date, emricasan has been studied in over 650 patients in sixteen clinical trials across a broad range of liver diseases. In multiple clinical Phase II trials conducted by Conatus, emricasan has demonstrated significant, rapid and sustained reductions in elevated levels of key biomarkers of inflammation and cell death, which play a role in the severity and progression of liver disease. Novartis scientists began to develop leads for the FXR agonism program in 2007. Through this effort, several non-bile acid FXR agonists have been identified and pre-clinical data demonstrates that these compounds are very selective with differentiated biological profiles. In animal models, FXR agonists have been shown to address three of the most important aspects of NASH progression by reducing fat, inflammation and fibrosis in the liver. First-in-human studies have continued to support their differentiated profiles and their potential for further development. 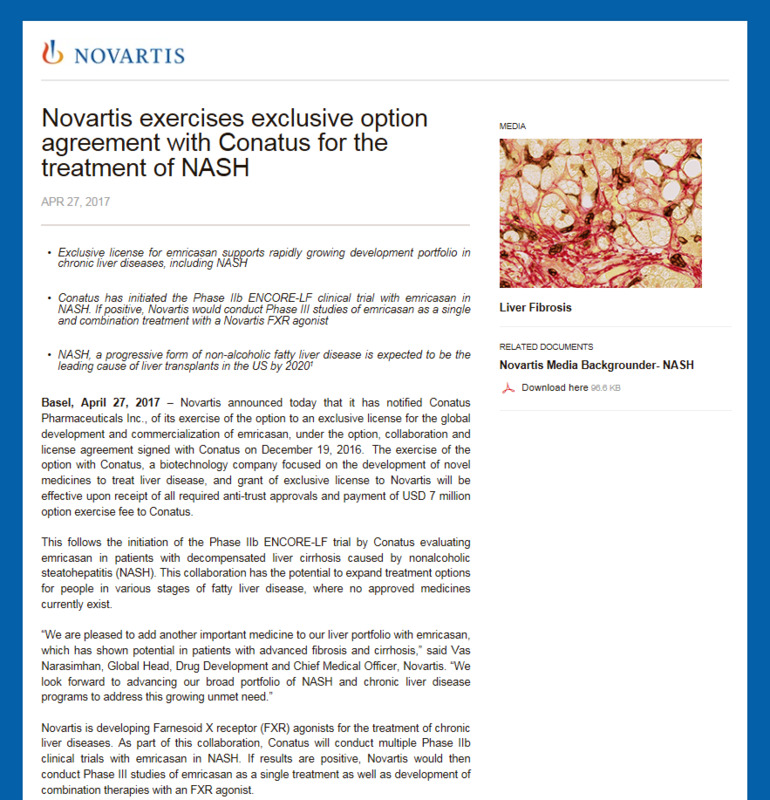 Two Novartis FXR agonists are now in worldwide clinical studies in NASH patients. The foregoing release contains forward-looking statements that can be identified by words such as "option," "growing," "portfolio," "initiated," "would," "expected," "by 2020," "will," "potential," "look forward," "investigational," "Fast Track designation," "to develop," "may," "can," or similar terms, or by express or implied discussions regarding potential marketing approvals for emricasan and the FXR agonists being developed internally by Novartis, either as single agents or in combination, or for cenicriviroc in combination with the FXR agonists being developed internally by Novartis, or regarding potential future revenues from emricasan and the FXR agonists being developed internally by Novartis, either as single agents or in combination, or from cenicriviroc in combination with the FXR agonists being developed internally by Novartis, or regarding the exercise of the option for the license for emricasan, or regarding the intended goals and objectives of the collaboration with Conatus and license for emricasan, and the clinical collaboration with Allergan. You should not place undue reliance on these statements. Such forward-looking statements are based on the current beliefs and expectations of management regarding future events, and are subject to significant known and unknown risks and uncertainties. Should one or more of these risks or uncertainties materialize, or should underlying assumptions prove incorrect, actual results may vary materially from those set forth in the forward-looking statements. There can be no guarantee that the necessary government approvals for the option exercise will be obtained in any particular time frame, or at all. Neither can there be any guarantee that any other closing conditions for the option exercise will be met in any particular time frame, or at all. Nor can there be any guarantee that the collaboration with Conatus and license for emricasan, or the clinical collaboration with Allergan, will achieve any of their intended goals and objectives, or in any particular time frame. Neither can there be any guarantee that emricasan or the FXR agonists being developed internally by Novartis, either as single agents or in combination, or cenicriviroc in combination with the FXR agonists being developed internally by Novartis, will be submitted or approved for sale in any market, or at any particular time. Nor can there be any guarantee that emricasan or the FXR agonists being developed internally by Novartis, either as single agents or in combination, or cenicriviroc in combination with the FXR agonists being developed internally by Novartis, will be commercially successful in the future. In particular, management's expectations regarding emricasan and the FXR agonists being developed internally by Novartis, either as single agents or in combination, cenicriviroc in combination with the FXR agonists being developed internally by Novartis, the option for the license for emricasan, and the clinical collaboration with Allergan, could be affected by, among other things, the potential that the intended goals and objectives of the collaboration with Conatus and license for emricasan, or the clinical collaboration with Allergan, may not be achieved or may take longer to achieve than expected; the uncertainties inherent in research and development, including clinical trial results and additional analysis of existing clinical data; regulatory actions or delays or government regulation generally, including a failure to obtain necessary government approvals for the option exercise, or delays in obtaining such approvals; the potential that any other closing conditions for the option exercise may not be met; the company's ability to obtain or maintain proprietary intellectual property protection; general economic and industry conditions; global trends toward health care cost containment, including ongoing pricing and reimbursement pressures; safety, quality or manufacturing issues, and other risks and factors referred to in Novartis AG's current Form 20-F on file with the US Securities and Exchange Commission. Novartis is providing the information in this press release as of this date and does not undertake any obligation to update any forward-looking statements contained in this press release as a result of new information, future events or otherwise. Banini BA, et al. Abstract #46. Presented at: American College of Gastroenterology Annual Scientific Meeting; Oct. 14-19, 2016; Las Vegas, NV.